Mother Nature has her own way of germinating seed. In the field, she provides warmth and energy from the sun, moisture from the clouds, and nutrients in the soil. Mother Nature also has a way of disappointing us from time to time, by either not bringing one of the essential ingredients essential to seed germination, or she sends too much all at once. 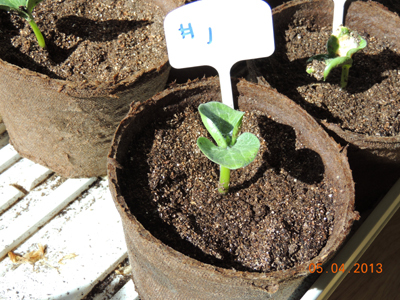 Germination of your pumpkin seeds is a very important first step to a successful, perhaps record breaking season. You can directly sow pumpkin seed into the garden in most areas. You need about 100 - 120 days for most varieties of pumpkins. Giant pumpkins and other giant varieties require 130 to 150 days. People with short growing seasons, or growers pursuing the big one, need to get a jump start on the season, by planting indoors. If you are growing Atlantic Giants, Big Macs, Prize Winner Hybirds, or other giant pumpkin varieties, the seed coat is quite hard and thick. It makes germination a little more tricky. There are some simple steps included below that you can perform that will help the germination process. Following the steps below will maximize the likelihood of successful germination. 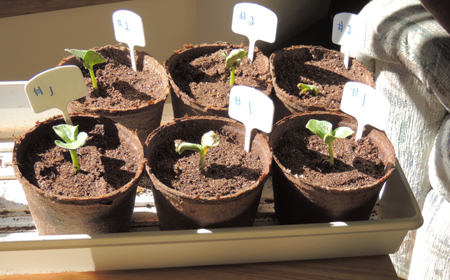 Then, watch your seedlings sprout, as you are on your way to growing big, monster pumpkins and cute little wee ones too! Viable seeds- Good seeds that are not hollow and are not so old, that germination rates are poor. Soil - A good, seed starting mixture that is light and sterilized. Water- The soil medium should be moist, but not soaked. Warmth - Here is where growers can add to their success. 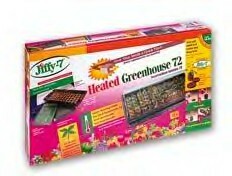 The ideal seed starting temperatures are between 80 and 85 degrees farenheit. Seeds can be germinated outside of this range, but the further away from the ideal range, the lower the germination rate. Soak the seeds in warm (not hot) water for at least two hours. Some growers soak them for up to 24 hours. We believe 3-6 hours is enough. Fill six inch peat pots with soil. Use a Seed Starter mix if you are new at growing pumpkins. Experienced growers often make their own starter mix, adding a number of other things. I add a little ash from the fireplace and some compost. Add the compost in the bottom inch or two of the pot, and make sure it is clean of insects. Plant the seed in the pot, 1"-2" deep. If you plant them any deeper, they may have trouble emerging from the soil. Place the seed on it's side. Water thoroughly. Keep the soil moist, not wet. Provide bottom warmth to the seeds. Experienced growers use a germination mat, which improves germination rates, and shortens the time to germination. Once the plant has sprouted, stop the bottom heat, as it can harm the roots. Now the wait begins! In four to six days the seedling will emerge from the soil. The word "Emerge" is a misnomer. Healthy plants all but explode from the soil, growing at a fast pace, even as a seedling. The total time to germination may vary. It is usually a week to ten days. If they have not sprouted after ten days, start a second planting. TIP: Coating the seeds with a fungicide offers protection against mold and fungus growth. Use this heated germination mat and seed starting tray to speed the germination of your plants. Upon emerging from the soil, pumpkins growers breath a big sigh of relief. We can close our eyes and almost see a thousand pound fruit nestled amongst lush, green pumpkin leaves. As we open our eyes, we immediately begin a new set of worries over nurturing the newborn seedlings in their indoors environment. Let there be light- - and plenty of it: The newborn pumpkin seedling immediately needs light, as much and as direct light as possible. Placing it by a window with a southern exposure is the first step. This alone may not prove to be enough for the seedling to grow healthy and strong. First, the sun is not up as long in the spring as it is in the summer. Second, there are many rainy spring days with little or no direct sun. Use an artificial grow light, or use florescent lighting to supplement the available sunlight. Place the pumpkins 6 to 8 inches below the light on cloudy days, and at night. The seedling will benefit from as much light as possible. Let There be Water- - in just the right amount: Provide water to the pumpkin every couple of days. Do not soak the soil each day. Overly wet soil is one of the basic ingredients for damping off disease. Let the soil dry out a little on the top first, then water thoroughly. Feed me, feed me: Your seedlings do not need a lot of extra nutrients in the first few days of it's life. Your seed starting mix should have plenty of nutrients. The seed also has some stored inside of it. After several days, add a little liquid fertilizer to the water. You do not need to give it full strength. When the roots are coming out the bottom of the pot, it is time to plant your seedling in the soil, weather permitting. Hopefully, you have timed this to the last frost, or have prepared a protective cover. If not, keep the bottom of the tray moist, or put some extra soil in the bottom of the tray. Or, transplant seedlings to a larger pot. Those of us who have grown seedling indoors for any number of years, know what "Damping Off" disease is. This is a white mold that forms on the top of the soil. Damping Off disease flourishes in cold, wet, damp weather, along with little sunshine. It quickly spreads across the soil and wilts the seedling. Take it's habitat away, and the disease can not survive. Pumpkins on the other hand, love just the opposite conditions. So, the more you make conditions ideal for pumpkins, the more likely you will avoid this problem. First, place the plant in direct sunlight. Stop watering until the surface is very dry. Better still, water from the bottom of the container. Scrape as much of the mold off the soil as possible. Stir the top of the soil as much as possible. Do this once or twice a day. It will speed soil drying. Increase room air circulation. You can gently blow air on your plant trays with a small fan. DO NOT sow seeds in the basement and leave them there for any length of time. While the trays are conveniently out of the way, this is a perfect breeding ground for Damping Off Disease. The day you plant your seedlings is one of the more exciting and anxious days. Often we start the seedling too early and it is growing so big that it needs to get into the ground. Or, perhaps it is not getting enough sunshine, or you want to get that jump start on the season. Whatever the reason, it is important either to wait until the chance of frost is over, or be prepared to spend time protecting the young seedling from cold and wet conditions. Note: If you direct sow seeds into the soil, you can plant earlier than seedlings. The seeds will need warm soil to germinate. While you can successfully grow giant pumpkins in most areas by direct seeding, you have taken a couple weeks off the growing season. If you are growing anything other than the giant pumpkin varieties, the season is amply long enough in most areas to direct sow your seeds. I know, you plan to do what the rest of us do each year.....beat the season and plant early. After all, maybe there will be no more frost. If you do so, be prepared to over up on cold or frosty nights. If you have not yet prepared the planting site, do so. See Site Selection and Preparation. If you have grown the seedlings indoors, you should "harden them off" a few days prior to planting. This is accomplished by placing them outside during the day for a few days prior to planting. Each day extend the hours and make sure to bring them in at night. More on Hardening Odd Transplants. Planting your potted seedling is one of the easiest tasks, assuming you have used a peat pot. Some people suggest you make slits and/or holes in the peat pot to allow the roots to escape more readily. Unless you have a really thick container, this is not necessary and not recommended, as you can damage roots in the process. The roots of most plants I have started indoors will have already pierced the pot before I set them out. Dig a hole in the bed you prepared deep enough for the entire pot. Fill in soil around the pot and plant. You can cover any or all of the stem up to the primary(first) set of leaves. Avoid disturbing the plant in the pot if at all possible during the entire planting process. Most plants will see absolutely zero transplant shock if handled gently. Do not push the soil heavily down around the plant. You can always add nutrient rich compost if the soil compacts and sinks. Thoroughly water the seedling immediately after planting with a light solution of liquid fertilizer. Keep the soil around the seedling moist. If you prepared the bed properly, the roots will be surrounded by plenty of nutrients for it's early life.You need not water too deeply at first as the roots are shallow. Avoid over watering at this point as you do not want to wash nutrients out of the bed that you prepared. Assuming you are a real pumpkin fanatic like me, you want to nurture your young prize producer in it's toddler period. The most important thing to guard against is cold weather and frost. Frost will kill the plant and cold weather will slow it's growth. Most people recognize the former, but are not as aware of the latter. Build or buy a cold frame or use a simple hotcap to cover the plant on cold nights. It does not need to be large or elaborate as the plant is small, and you just need to maximize the overnight temperatures. A little scrap wood and plastic sheeting is all you need. Cover the plants on cool nights, even if there is no frost warning. Make sure to uncover them in the morning before or very shortly after the sun reaches them. If you forget and leave it on during a warm, sunny day, you will have some replanting to do when you get home from work. As you surf the Internet you will find others who have gone to the extreme of providing small space heaters inside a hotcap or cold frame. These are people who are even more rabid fanatics than this writer. If you are in a northern climate with late springs(especially in Canada), you may need to consider this in order to provide the plant a long enough season to produce a monster pumpkin. Now is the time to begin preparing to Chart your Pumpkin's Growth.